- [ DURABLE MATERIAL ] --- Bubble machine is made of eco-friendly ABS material, non-toxic,wear resistance, sturdy and not easy to break, durable for long time use.Kids will play fun with watching loads of exciting bubbles pour out of its mouth in a continuous stream! - [ AMAZING OUTPUT BUBBLES ] --- Crab Bubble Machine can produce colorful bubble madness. Blow out countless bubbles and keep your kids entertained. Creat a dreamlike bubble world for kids.adding more bath cream,the bubble is more plenty. 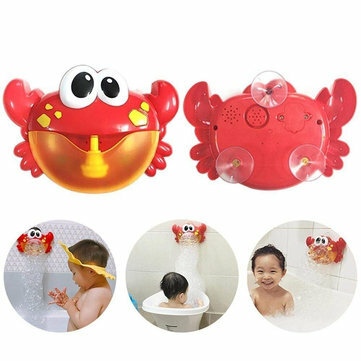 - [ BEST BABY GIFT ] --- Bubble crab is a small magic weapon that makes the bathing room laugh for all age of baby, toddler and kids.It is also an wonderful baby shower,birthday christmas or party gift. It will add joy and good atmosphere to your family. - [ EASY OPERATE ] ---Can be firmly fixed in the bathtub or on the bathroom wall with 3 suctions cups in the back of soap bubble machine.Simply pour the solution into the reservoir, pushing the button to provide a steady stream of bubbles.Power by 2 x AA batteries(Batteries not include). Waterproof NO! Please Don’t put it into the water!